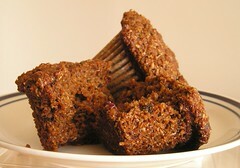 Healthy Bran Muffins - Do You Know The Muffin Man? Notes: A little different from ordinary bran muffins: natural bran was toasted before baking; prunes are simmered in water and then puréed (I used the leftover molasses sauce instead, and reduced the sugar). Texture is coarse and moist, not dense or cakey.